One of the words that I use when defining myself is Patriot. To me this is not the same as being nationalistic or blindly loyal. It means that I align myself with the values and beliefs that created this nation and continue to make great. I've read the Declaration of Independence and U.S. Constitution. Thanks to my father, I keep copies of these documents on my desk at work to remind me of what we are all about. Several months ago, the Westboro Baptist Church (WBC) was planning to attend and disrupt a service member’s funeral here in Michigan. This group has taken it upon themselves stretch of permissions granted by the First Amendment to mean that insulting others beliefs is not only permissible but their life's work. Whereas I don't agree with that position, I do think that if they are allowed to do that I am allowed speak against the WBC. That was when I found out about the Patriot Guard Riders (PGR). The PGR was planning on forming a wall between the WBC and the funeral to prevent the WBC from disrupting it. I considered that worthwhile. The Patriot Guard Riders is a diverse amalgamation of riders from across the nation. We have one thing in common besides motorcycles. We have an unwavering respect for those who risk their very lives for America’s freedom and security. If you share this respect, please join us. I became a member of the PGR and started to receive e-mail regarding their missions. Many of these missions were funerals for service members, but they also greeted returnees from Iraq and Afghanistan and also where there is say goodbye service members deploying. The problem for me was that many of these events were either short notice or during the week when I found difficult to take a day off to attend. Then I got the notice earlier this week about a dedication ceremony for a Blue Star Memorial in Union City. Not only was it on a Saturday, it was only about 18 miles away. I found my first PGR mission. Note: I realize that there are many ongoing arguments and apparently lawsuits about the ownership, control, and philosophy of the Patriot Guard Riders between state and national level organizations. I am not here to address any of those issues; my reference to the PGR is directly related to the local members I have met and its noblest intentions: public support of our military. I arrived a little early, but of course, people were already at the rally point. I was warmly greeted and in several instances given the hug of a long-lost brother. Most of the men and women who were there were veterans like myself a majority of them had served in Vietnam. I was one of three first time riders. Before too long we left the rally point and traveled to a small park were the actual ceremony was going to be held. From the moment we arrived, we were warmly greeted by the ladies of the Garden Club, who were organizing the event, as well as several local politicians and dignitaries. I think I must've been thanked at least a dozen times, and at that point, all I had done was to show up. We were given our flags for the ceremony and formed up behind the podium. You can usually tell someone who has been in the military at some point in their life by looking for something known as bearing. Bearing is another way of saying "the way you carry yourself"; people who have served have a particular way of carrying themselves. Even though I and most of my fellow PGRs had been out of the military long time, our presence on the line showed a great deal of military bearing and respect. It has been several years since I took part in a ceremony that was rooted in pure patriotism such as this one. All of the speakers transcended politics and spoke from the heart about veterans and their gratitude for their service. There was the playing of the National Anthem, everyone saying the Pledge of Allegiance, and a benediction. All of this took place without protest or demand for some special accommodation. I was truly in the midst of fellow patriots. Our role was simple, we were an honor guard and we stood there. However, we were also serving as a living example of the veterans who were being honored by the Blue Star Memorial that was being dedicated on the day. Almost every speaker of the dais thanked the PGR at some point. My purpose there was to honor other veterans and I was finding myself being honored. The history of the Blue Star Memorial and how a small Garden Club in New Jersey started this 67 years ago is worth reading. A very simple idea to honor the veterans of World War II that has now gained new traction. At some point, take a moment and check it out for yourself here. The service itself was not very long and in the closing prayer, the minister mentioned that she hoped at some point that the Memorial would serve not as a reminder of men who served in a war but of men who had brought about peace. After it was over, we found ourselves called back for photos in front of the Memorial that had just been dedicated. I remarked to one of the fellow PGRs that I had served in Gulf I and was a Cold War Veteran (by the way, we won) but that I had never been thanked as much during that entire period as I was during the few hours we were there. That is very true. I guess there's something to be said for the patriotism that can be found in a small-town. I consider myself a Patriot not because of my willingness to put on a uniform to defend the ideals that I believe in -- but also a willingness to assume a new role of giving of my time to ensure that other patriots feel properly honored. 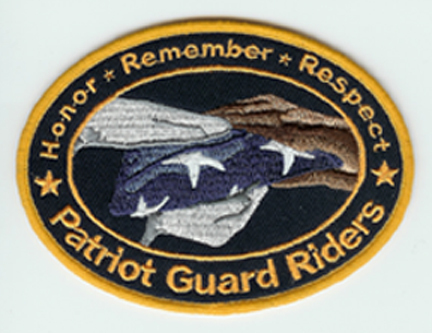 I am proud to say that I am a member of the Patriot Guard Riders and that the PGR is there to ensure that those who serve are recognized, honored, and thanked. They are true patriots.